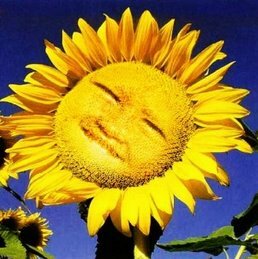 Excuses present themselves all the time, excuses for why you can't do one thing or another in the garden. It's too hot, it's too dry, it's too wet, it's too cold. It's too early, it's too late. Or my new favorite..."there's a bird's nest over there that I don't want to disturb". 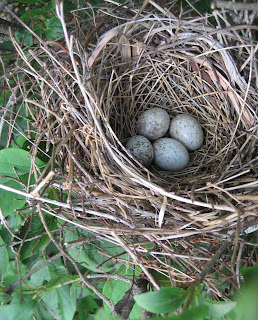 This evening I found a nest of eggs in my 'Miss Kim' lilacs, about five feet off the ground. Does anyone know what kind of bird this is by the seeing the eggs? Mama bird was way up on the neighbor's roof squawking at me and telling me to get away while I carefully parted the branches and took this picture. Now I have an excuse for not pruning off all the seed heads on the lilac. It's a tedious task but I think it increases the next year's bloom when you do it at the right time. 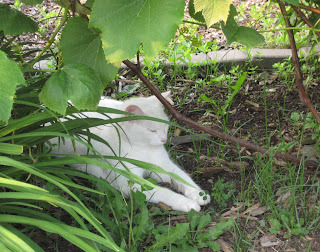 Later, I found my neighbor's cat, Jake, lounging beneath my grape arbor, back by the vegetable garden. Later as I was wrapping up my work in the garden this evening, which including mulching around the trees and watering the container plants, I decided to quickly check the vegetable garden to see if my squash or corn or beans were coming up. The bunnies have eaten off at least six tomato plants, six pepper plants, and all but one eggplant plant, maybe more. 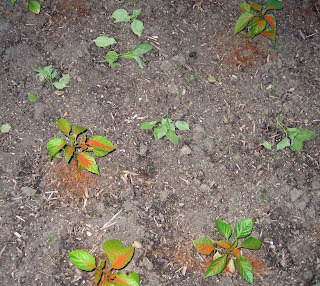 The picture above is of the pepper plants after I dusted them with cayenne pepper. The ones without pepper on them are the ones the bunnies chewed off. And they don't even eat the whole plant, they just bite it off. What is Jake's excuse? I left him in charge! He was supposed to be keeping the rabbits out of the garden. Fortunately, the corn and beans have row covers on them, so the bunnies can't get to them, and they are sprouting. The squash is not covered, so I sprinkled them with cayenne pepper, too. Any other suggestions for keeping the rabbits away? Here's some Beard-Tongue blooming in my renovated perennial garden. 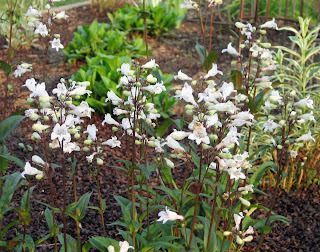 It's fancy botanical name is Penstemon digitalis 'Husker Red'. I like the white flowers with the red stems and the dark green foliage. And the white flowers glow at night. 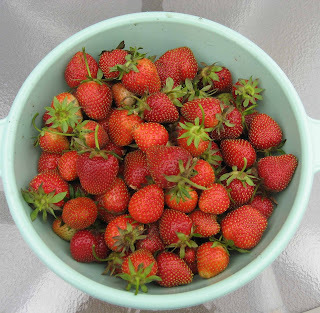 And I picked more strawberries yesterday, a big bowl full. I'll be eating these all week, and I think there are this many more berries ready to pick today. The variety is 'Ever Red', and I hope they produce some berries all season, though I know most of the berries will be ready to pick this week. And that's today at May Dreams Gardens. What excuses do you have? Carol, I'm sorry about your garden. Between the long winter, short spring, lack of rain and rabbits, it can be frustrating can't it? The strawberries look yummy! I have never been able to understand why the rabbit's bite the foliage off the plants, and then don't eat it. I could almost forgive them if they were hungry and ate the plant, but to waste it?? I still battle them daily too, they seem to have caught on to the traps....so, cayenne pepper seems to be the only solution. It's a good thing the dollar store sells it so cheap, I go through a lot of it. Carol, no bunnies back at the ole homestead - can you guess why? Those strawberries look so yummy! I'm sorry about your garden....Jake's been slacking off, apparently. I don't have any suggestions that you haven't already mentioned. I don't know what kind of bird that is, but you are so lucky--two easily-viewable bird's nests in one season! Keep us updated, okay? It is amazing that a bird would have a nest that low to the ground especially on a 'Miss Kim' lilac whose branches are not so robust. I guess predators would have a difficult time trying to climb those skinny branches though. Our cat only goes after things when it suits him. A bit of a coward too so he won't go after the squirrels which are numerous. We planted some roses in the former vegetable garden because the rabbits, ground hog, deer ate practically everything. Guess what? I think the rabbit chewed off almost all the rose shoots. I gave the plant a good spraying with a mixture of Dave's "Insanity Sauce" a habanero based hot sauce. Even opening the bottle causes my eyes to tear. My wife who can crunch into fiery bird peppers tasted a smidge of Dave's sauce and immediately spit it out proclaiming it the hottest thing she ever tasted. About a teaspoon full in a 1/2 gallon sprayer with a few drops of detergent as a wetting agent should do the trick. The only problem is you have reapply after a rain. Your Penstemon 'Husker Red' looks terrific. We stopped growing it because they always fell over. I'm pretty sure those are House Finch eggs. They tend to nest about 5 ft off the ground, and will pick the most percarious (sp?) of places to build. I have one in a rose bush right beside where hubby parks his car. The babies just hatched, so hopefully soon I can weed in that spot.... it's been about a month and the weeds have gone crazy! We have no rabbits because we have three barn cats. But there are some down sides to that too. Cats use flower beds and vegetable gardens for litter boxes. Yuck! Maybe the red pepper power will work for the cats! I'll give it a try. Hey....I wonder what my fairy garden would look like with cayene pepper sprinkled on it...teehee! Carol, I'm so sorry to hear about the rabbits! I found rabbit turds in the yard yesterday, but with six outside cats, we'd better not be having any plants chewed off! I have 'Husker Red' too, but my foliage is much darker than yours, and some is almost burgundy. Not quite blooming here yet, but very soon! I am sorry about your plants! No bunnies here, but I do battle my own ducks and geese regularly. The geese also bite off new shoots and leave them laying there, and the ducks want to climb into the middle of every shrub they can to lay eggs. I know it sounds like a pain, but maybe hardware cloth can help? I have to do that to protect things from the geese. I buy a roll that is 4 feet high and cut a length of about two to three feet long, depending on how big of a circle I want. Then I use zip ties to tie the ends together, making a circle around the plant. You can stake them down if necessary with tent stakes, but I haven't had to. Almost forgot - those strawberries look divine! Carol: I agree with qt - the best defense against bunnies is a good fence of some sort. Until I physically blocked off my plants, I kept having problems. I tried cayenne, various homemade remedies involving rotten eggs, garlic and/or hot pepper sauce, but the first time you forget to apply after a rain, those pesky rabbits seem to know. P.S. - Those strawberries look delicious! Jake does not look too hungry, maybe that is why the rabbits have been snacking on your garden :). I have tried several times to grow Husker Red in my garden but it does not thrive for me so it must not be happy here. Since Jake is not saving the tomatoes, Carol - here's a way to eliminate rabbit damage by using wine sauce. I'll lend you my dogs. They are old and very well behaved. Being old, however, wouldn't stop them from a good rabit chase. The only drawback is the whole California Indiana thing. Darn rabbits! I highly recommend the Jack Russell Terrier for all your vermin deterrent needs. IU've also had great success with thin strips of silver mylar strung over the beds, they're light and the slightest breeze moves them and it seems to keep the rabbits at bay. Thanks all for the comments and helpful suggestions. I know I'll win over those rabbits someday! And some of you have offered me your pets on loan, how nice! I've tried cayenne pepper but sometimes the leaves of plants would burn terribly from it. Also started worrying about the rabbits getting it in their eyes when they brushed the plants. I get really mad at them but I didn't want to torture them. Now I'm using liquid fence. I spray it directly on my flowers and for vegetables I spray the ground around the perimeter of the bed and not on the plant itself. SO FAR it seems to be working. You use it once a week for two or three weeks and then once a month. I had a cardinal nest in my clematis and the nest and eggs look the same from your photograph. Though I believe mockingbird eggs look similar. 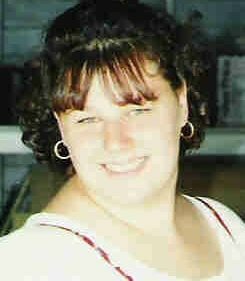 I live across the Wabash from you in downstate Illinois. I forget WHY I live here. I just do. Between my small home lot and my BIG lake house lot, I always seem to have more gardening to do than the creator of Eden... so I'm pretty good at excuses. I forget why I haven't started building that greenhouse I planned, but I'm sure I have a good reason hidden somewhere in my psyche. The Penstemon is gorgeous - I love the red stems. Regarding the rabbits, my dogs Wood and Stanley would be delighted to help you out (but just know that the outcome could be a gruesome one) - needless to say, I rarely see a rabbit around my place!